A simple, unstuffed roasted turkey served with an apple cider gravy that smacks of autumn. For Turkey: Preheat oven to 325°F (160°C). Insert meat thermometer, if desired. Brush butter over breast and sprinkle with 1/2 teaspoon salt and 1/4 teaspoon ground black pepper. Place turkey on a rack in a roasting pan. Roast until juices run clear when thigh is pierced with a fork or meat thermometer registers 170°F (approximately 75°C), about 3 hours. Remove turkey from pan and cover loosely with foil. For Gravy: In saucepan over medium heat, bring giblets and 4 cups water to boil. Reduce heat to low and simmer 1 hour. Add cider to pan over medium-high heat. Bring to a boil, scraping up browned bits; reduce heat and simmer, until reduced by half, about 5 minutes. In saucepan, over low heat, combine reserved fat and flour; cook 3 minutes, stirring constantly. Stir in cider mixture and then giblet broth. Increase heat and simmer until thickened, about 10 minutes. Stir in sage and remaining salt and pepper. 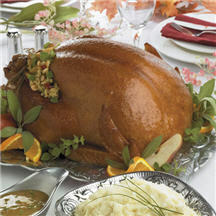 Slice roasted turkey and serve over gravy.